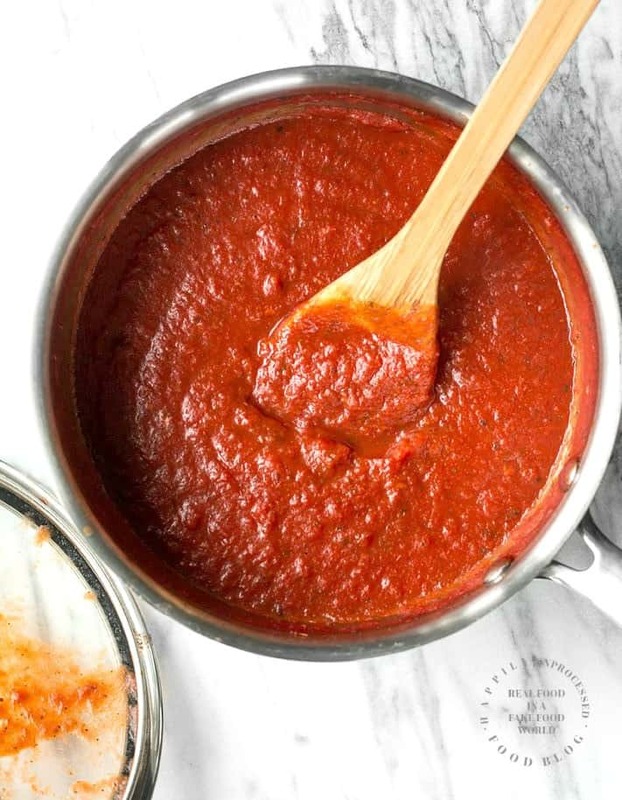 6 staple pantry ingredients and some spices is all it takes to make a great tomato sauce. But is it called marinara or spaghetti sauce? I spent a lot of time deciding what to call this recipe. Some will argue that Spaghetti sauce isn’t actually a thing. 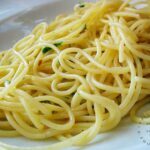 Spaghetti sauce is essentially any sauce that you put on top of spaghetti like alfredo, Bolognese, even oil or butter for example. 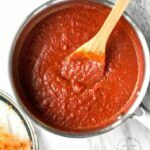 IS THERE A DIFFERENCE BETWEEN MARINARA AND SPAGHETTI SAUCE? Marinara sauce involves tomatoes, garlic, onions, but it never contains meat or cheese. Once you add meat it then becomes a Bolognese or Spaghetti sauce. When we Americans here ‘spaghetti sauce’ we think of a thicker, flavorful sauce, sometimes with meat sometimes without. Marinara sauce on the other hand tends to be a little thinner. So armed with all this knowledge, I still don’t know what to call my sauce. It is thicker than marinara, but it does not contain meat. So … it’s a THICK marinara? 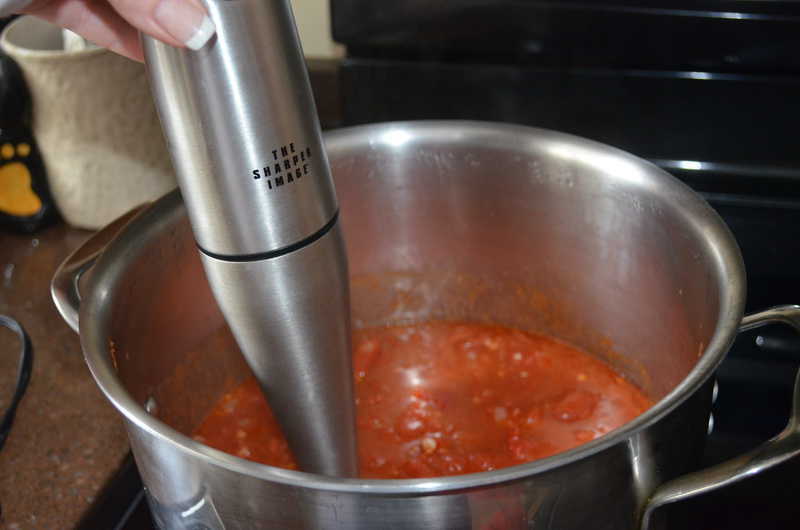 Now that we got that out of the way, let me show you just how easy it is to make spaghetti sauce at home. WHAT MAKES A GREAT SAUCE? Tip #1 – Get Good Tomatoes. This is KEY for making a good sauce. San Marzano seems to have the best tasting tomatoes on the market. Just my opinion and the ones I tend to get when I make sauce now. Tip #2 – Use Fresh Herbs. Another key component to a good sauce. Dried herbs do not come close to the flavor of real herbs, ESPECIALLY basil. Even though it’s hotter than you know what in the summer, that’s when I tend to make the most sauce. Tip #3 – Use a Parmesan Rind – you know that hard part at the end of the parmesan block? That’s the rind. Don’t ever throw that away. 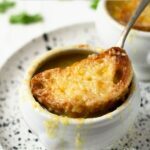 I even did a post on it here that’s how much depth it can add to soups and sauces. It doesn’t taste cheesy, but it adds great flavor. Tip #4 – Time. A good sauce takes time. If you don’t have hours to watch your sauce simmer, may I suggest using your slow cooker. It is perfect for sauces like this. Just put it on low for a few hours while your sauce comes together. Tip #5 – Emulsify. I think this step came naturally because when my kids were smaller they could pick out even the smallest of onions. Is this necessary? Probably not, but it does create a really smooth sauce. CAN YOU FREEZE YOUR SAUCE? You can ABSOLUTELY freeze spaghetti sauce. The best way to do it is to let the sauce cool completely and put it in a large freezer Ziploc bag. Squeeze all the air out and lay it flat. I mean let’s be honest, if you are going to take the time to make this sauce you might as well double or triple it, right? And like I mentioned, I tend to make a lot of sauce in the summer when the tomatoes and basil are in season. That way come winter, all I have to do is make the meatballs. In a large stockpot saute the onion in olive oil over low/medium heat until translucent. You don’t want the onion to brown so keep the heat on low and stir often. Season with salt to help the onion sweat. You can also add a sprinkle of sugar as well. Add the garlic and stir another minute. Stir in tomatoes, salt, sugar, bay leaf and rind. Partially cover and simmer for 90 min stirring occasionally. Remove the bay leaf and rind and using a hand emulsifier, emulsify the sauce until smooth. 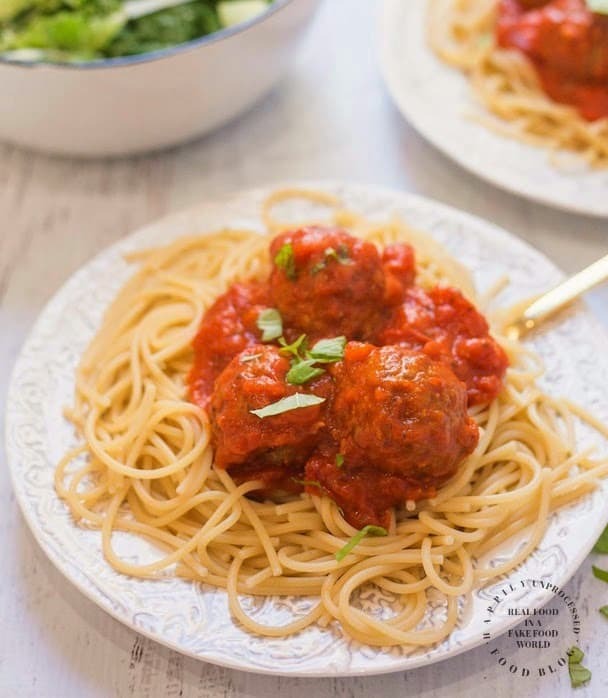 You can make this a meat sauce by simply browning 1 lb of ground beef (turkey or sausage) with the onion and garlic, then continue with recipe as stated in Step 2. Looks like a delicious recipe! About how many people will it serve? I’ve never counted Lisa but every time I make it it serves my family of 4, leftovers always end up being meatballs subs (so I use a little of the sauce) and then I freeze what’s left and it makes another batch. So all in all, I would say at least 8. It also depends on if you are going to simmer meatballs in it, that soaks a little of it up or it you add ground beef/pork for a meat sauce.